The Borussia Dortmund youngster believes the team’s coach is responsible for the way he has grown into the Bundesliga. 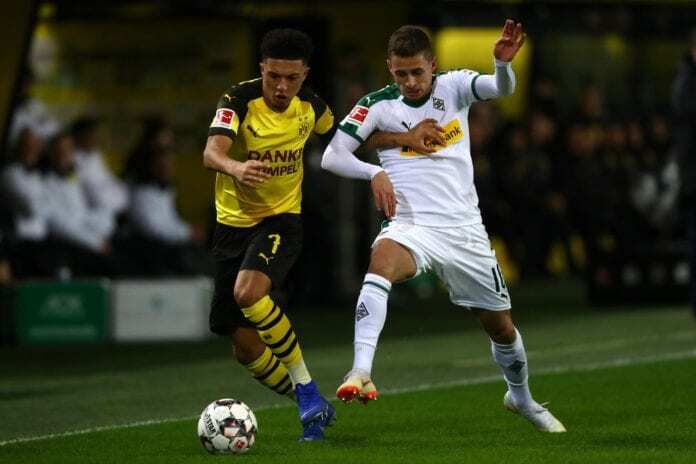 According to Borussia Dortmund wonderkid Jadon Sancho, the way he has grown into the Bundesliga is thanks to the support of coach Lucien Favre. Favre has chosen the 18-year-old to be a starter on his squad, as they are battling in the German competition looking for a trophy. Dortmund is currently in the first position of the Bundesliga table with 49 points, they are seven points ahead of second-place Borussia Monchengladbach and Bayern Munich. BVB has won 15 of their 20 matches so far in the competition, drawing four times and losing only one game. And Sancho is happy to be part of this success. “It’s a noisy stadium and it’s not every day that you get to play in front of 80,000 people. I’m just grateful,” he said. “I believe in myself in one-on-one situations. I used to look at Ronaldinho, growing up, on YouTube,” he explained. The 18-year-old is a product of the youth systems of Watford (from 2007 to 2015) and Manchester City (2015-2017). In 2017 he was sold to Borussia Dortmund, where he started playing for the second team, but quickly gained a chance in the senior squad. He has also played in the England national team young squads, and last year received his first call-up to the senior team.